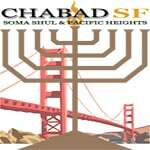 Services with Chabad of SF are designed to make everyone feel welcome and at home. The prayers, conducted with Hebrew/English prayer-books, are lively, engaging and inclusive – spiced with inspiring tunes and insightful explanations throughout – allowing all to absorb the experience at their own level. Whether you consider yourself Reform or Conservative, Orthodox or unaffiliated, Sefardi or Ashkenazi, well-versed or unversed; at Chabad, the labels and classifications fall away – as all stand equally beloved before G‑d. Sermons and announcements likewise speak to all participants and are always topical, relevant, stimulating and enlightening. Tickets are FREE! Please RSVP so we can plan accordingly.